Dublin Airport (DUB) is located in Collinstown, which is approximately 5.5 miles North of the city of Dublin itself. The airport in Dublin is now a major International Airport that has a large number of airlines flying into it each day, with Aer Lingus and Ryanair being the main two carriers. 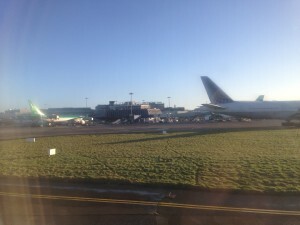 Due to the increased traffic, Dublin Airport is now the busiest of the airports in Ireland and services the capital city of Dublin, as well as many other towns and cities in Ireland. As you can imagine, the Arrivals and Departures areas at Dublin International Airport can become very busy, especially during the peak times. To make the Arrivals and Departure process safe and efficient, there are certain Security regulation that are in place at the airport, that passengers are required to abide to. Failure to abide by the Security Regulations that are in place at Dublin Airport, will only slow down the process of clearing Security and may even result in you not being allowed to enter the country upon arrival or board your plane for departure. It is advisable to be familiar with these regulations before travel and ensure you have the required documentation with you. Any passenger wishing to fly from Dublin Airport will first need to make their way to the Departures area. If the airline to whom you are flying with offers Online check-in and you have chosen to use it and you are only travelling with hand luggage (Hand Luggage Allowance – Hand Luggage Restrictions – Hand Luggage size), you can make your way straight to the Security area. If you have checked-in Online but are travelling with checked-in Hold luggage, you will need to go to the check-in ‘Bag Drop Off’ desk, which has been allocated to your flight. If you would like to check-in at the airport, you will also need to make your way to the check-in desks that have been allocated for your flight. Monitors in the Departures are, will display which desks are assigned for your flight. Each Terminal at Dublin International has its own check-in are for passengers wishing to check-in at the airport. Terminal 1: The check-in desks at Terminal 1 are located on the first floor. Terminal 2: The check-in desks at Terminal 2 are located on the Ground floor. Several airlines at Dublin Airport, now offer ‘Self Service Check-in’ kiosks that allow passengers to check-in themselves and tag their own bags. Fast Track is now available at Dublin Airport, which simply means you can ‘Fast track’ and clear Security even quicker. However, to use Fast Track at the airport, you will need to pay a fee in advance. Fast Track is available in both Terminals 1 & 2 and is a good option during peak times, when the queues at Security can become very busy. Once your aircraft has landing, it will taxi to its allocated parking bay and you will be asked to disembark the aircraft when it is safe to do so. You will then need to make your way to the airport Terminal either by using an air bridge or by courtesy bus. Once inside the airport terminal, you will be required to make your way to Security and Passport Control, where you will need to present the appropriate documentation. Once successfully through Security, you can either make your way to the ‘Baggage Reclaim’ area (if you are travelling with checked-in Hold luggage) or simply make your way to the main Arrivals Lobby Exit. If you are travelling to Dublin Airport with checked-in Hold luggage, then you will need to wait in the Baggage Reclaim area and await your luggage. Each flight is allocated a carousel and you will need to locate the carousel for your flight. The overhead monitors will display which carousel has been allocated for your flight and once you have found the right carousel for your flight, simply wait next to it for your luggage to arrive. There are two Terminals at Dublin Airport are they are Terminals 1 and Terminal 2. Each Terminal has a large number of flight arrivals and departures throughout the day from a variety of different airlines that service Dublin. If you are flying from Dublin Airport, it is advisable to check which Terminal the airline who you are flying with departs from. Due to the large number of passenger traffic that arrives at and departs from the airport every day, the Airport has a very efficient Ground Support system in place, which makes getting to and from Dublin Airport to the centre of Dublin and other destinations in Ireland very easy. Getting to and from Dublin Airport by public transportation is very easy and very cost effective. There are now several bus service that operate from the airport and provide regular bus services from Dublin Airport throughout the day. Aircoach: Aircoach provide services 24 hours per day to the centre of Dublin itself and also other destinations in South Dublin. The bus service that runs from Dublin Airport to the city centre, also stops at the majority of the popular hotels in Dublin City. Airlink Express: The Airlink Express, provide passengers with services to Dublin city centre, merrion Square, Heuston & Connolly rail stations, College Green & Temple Bar, the IFSC, St. Stephen’s Green and Gardiner Street. Dublin Bus: The Dublin Bus services from the airport provide passengers with many different destinations. Some of these destinations include Sutton Station ( bus 102) – Ballinteer (Bus 16 and Lower Abbey Street (bus 31). The Dublin Airport 747 bus service, is one of the most popular bus services from the airport and runs every 10 minutes throughout the day from Dublin Airport to the central bus station in Dublin at Busaras. The Airport Hopper: The Airport Hopper from Dublin nternational Airport, provide shuttle bus services to a number of different destinations throughout Ireland. The hourly bus services run from Dublin to Maynooth and Tallaght, which also stop at Liffey Valley, Lexlip, Clondalkin and Lucan. There are a number of coach operators that provide coach services from the airport to a large number of destinations throughout Ireland. The coach services are a very viable option for passengers travelling by themselves or on a limited budget, who wish to reach destinations a little further away. Ardcavan: If you wish to get to Wexford from the airport, Ardcavan run a service to Wexford each day from Monday to Saturday. Bus Eireann: Bus Eireann have a number of different bus services to many different destinations. Dublin Coach: If you are wanting to reach any of the following Kildare, Portlaoise, Red Cow LUAS, Waterford, , Limerick, Tralee and Killarney, Kilkenny or Ennis, the Dublin Coach offers services to these destinations. eireagle.com: The express service, transports passengers to both Limerick and Galway in just 2 hours 30 minutes. GoBus: GoBus provide bus services from 06:45am up until 23:55pm, that run between Galway, Dublin and the airport. JJ Kavanagh: JJ Kavanagh, provide coach services to Clonmel, Limerick, Kilkenny, Waterford and Tramore. John McGinley: Services from Dublin Airport to Annagry and Moville. Irish Citylink: Irish Citylink provides direct Dublin Airport bus to Galway at regular intervals throughout the day. The journey takes just under 3 hours, depending on traffic. Wexford Bus: Wexford Bus services from Dublin Airport to Wexford Town at regular intervals throughout the day. Taxis can be found outside of the main Arrivals Lobby at both Terminal 1 and Terminal 2. A popular choice with many passengers arriving at Dublin and wishing to take a taxi to their final destination, is to pre-book one in advance. There are many advantages of pre-booking your taxi in advance and it is a great way to ensure you have a taxi waiting for you upon arrival, avoid waiting in a queue, reduce the stress and eliminate worrying how much the taxi will cost. It is possible to hire a car on the day at the airport but you will always pay premium price if you do. Pre-booking your car hire is always the best option as it will ensure you reserve the car you want and will generally guarantee you get the best deals on your car rental Dublin Airport. Dublin Airport provides a number of different types of parking for passengers and whether you are dropping passengers off, picking passengers up or travelling and want to park your vehicle for a short or long duration, there will be parking available to suit your needs and requirements. You can either drive up to the car parks on the day of travel or you can pre-book your car parking at Dublin in advance, which is always advisable. Both Terminal 1 and Terminal 2 at Dublin Airport have designated ‘Drop Off’ areas for motorists dropping off passengers at the airport. However, these designated ‘Drop Off’ areas are specifically for dropping off passengers and vehicles must not be left unattended at any time. If a vehicle is left unattended outside the Terminals is the ‘Drop Off’ areas, they will be towed away. If you are picking up passengers arriving at Dublin Airport, then it is advised to use the ‘Short Stay’ car parking facilities at the airport. The ‘Short Stay’ parking is charged on an hourly basis and the fee will obviously be determined on the duration of your stay. Dublin Airport provides over 4000 designated Short Term parking spaces for passengers and these service both Terminals 1&2. The short term parking at Terminal 1 is known as Short Term Parking ‘Car Park A’ and ‘Car Park C’. Car Park A is located within a 2 minute walk from both terminal buildings and has 450 spaces. Car Park C is a multi-storey car park with 1500 available spaces and is located within 4 minutes walk of Terminal 1 and just a few more minutes walk from Terminal 2. Located next to Terminal 2 and within a 4 minute walk to the airport terminal via a covered walkway, the Multi-Storey Terminal 2 Short Term Car Park has 1800 spaces for passengers. The Terminal 2 Surface Car Park is within easy access and just 4 minute walk to both Terminals. It has 270 car parking spaces available to passengers. There are 3 ‘Long Term’ car parks at Dublin Airport and collectively, they provide 18600 parking spaces for vehicles at the airport. The three Long Term car parks are known as ‘Express Red Long Term Car Parking’, ‘Express Green Long Term Car Park’ and the Holiday Blue Long Term Car Parking. Express Red Long Term Car Parking: This is the closest Long Term car park to the airport and has 7000 spaces available to passengers. There is a courtesy shuttle bus that transfers you to the terminals from the car park and from the airport to the car park on your return journey. The shuttle buses run 24 hours and the transfer time takes around 5 minutes. The Express Green Long Term Car park, is available during the Summer months and has 2000 spaces, it is perfect for passengers going away on their holidays. The car park is great for both Terminals 1 and 2 and there is a free shuttle bus (24 hrs) that transfers to the airport, which takes approximately 5 minutes. The Holiday Blue Long Term Car Park, is located a little further away and takes roughly 10 minutes transfer on the free 24 hours shuttle bus. The car park has 7000 spaces and is generally a cheaper option of the three car parks. Both Terminal 1 and Terminal 2 parking at Dublin Airport provide designated spaces for people with reduced mobility who hold a disabled parking permit. The spaces are all accessible with wheelchairs and also have nonslip surfaces. Terminal 1: On the lower ground Short Term B car park, there are 50 designated parking spaces for people with reduced mobility. Terminal 2: Has 40 spaces designated for people with reduced mobility.